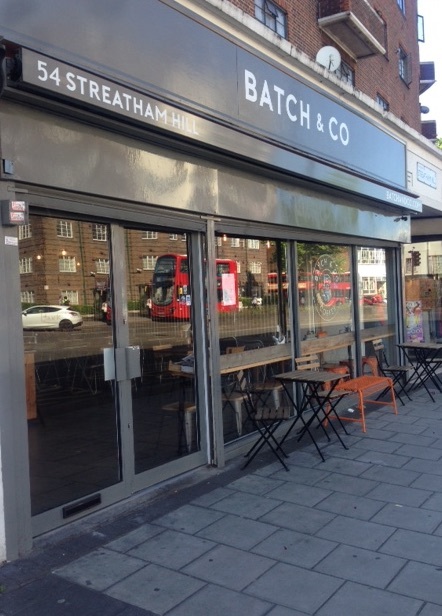 A short while ago, on the advice of London’s Best Coffee (and Beanthere.at), I headed along to Streatham to try a couple of cafés including Batch & Co along Streatham Hill Road. The café is quite modern and cubic with plenty of tables at which to sit and enjoy some good coffee and food. Another interesting recommendation from these sites to add to the list. The counter is on the left as you enter and there was a good selection of cakes on offer that day. Is it possible to have too much cake in one day? Sadly, possibly it is and so, as I had already had my fill of cake at a previous café, I kept with just an Americano (roasted by Caravan). Tap water (infused with mint) was available at each table which was greatly appreciated on such a hot day as the one on which we visited. There were many things to notice in Batch and Co. The street/bus sign above the counter, the large selection of books in the corner (what a shame the seats next to the shelves had been occupied already! ), the corrugated zinc walls and then, the cassette tapes on the tables. What a blast from the past. Sadly these tapes were no longer being used to store music but instead as table number indicators. Now ordinarily, I think these cafe-physics reviews should be the sort of science that is accessible to everybody, the sort of observation that anyone could make. But today, today the temptation is just too great, because these cassette tapes are linked to something that is being researched in an obscure but very novel effect that just happens to be an area of research for me. So today, I hope you will stay with me as I take you from Batch & Co to a very odd effect that happens when things (cassette tapes) get very cold. 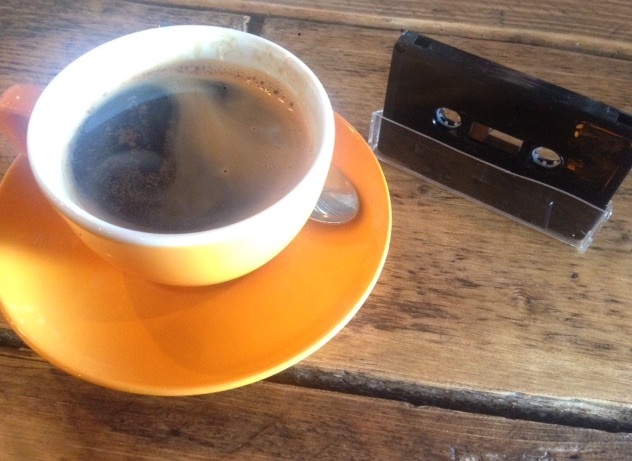 Coffee and tape. Who knew how special the tape material would be? Those cassette tapes used to work by writing and reading magnetic information. So the actual tape bit needs to be a magnetic material. The first generation of tapes were made with ferric oxide (Fe2O3) but later, and seemingly better, music tapes used chromium dioxide, CrO2, as the tape material. 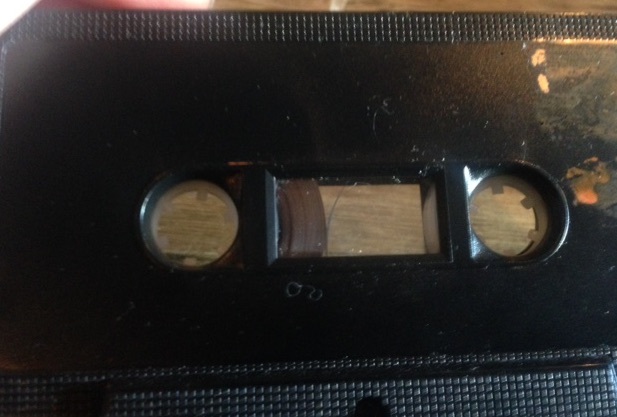 Nowadays the technology of tape cassettes has been superseded by other media but the material CrO2 lives on, it turns out it is a very odd type of material. Just like iron, chromium dioxide is magnetic, which is why it was used in tapes. But chromium dioxide is a very special type of magnet in that it is what is known as a fully spin polarised magnetic material. To understand what that means, it’s helpful to compare it with iron or copper or indeed, any other metallic material that you can think of. Metals conduct electricity because the electrons in them are free to move from one contact to another and hence carry a current. Electrons are negatively charged particles but they also have a property called “spin”. Although spin is associated with angular momentum (rotation), it is fundamentally a quantum mechanical property of subatomic particles and so shouldn’t be thought of as being about the electron’s rotation on its axis (rather like the Earth rotates). Indeed, it seems that this quantum mechanical property of “spin” is something that is very hard to pin down, even amongst physicists (see here). So instead, generally speaking, we just think about spin having two ‘directions’: spin up and spin down. An alternative use for a cassette tape. 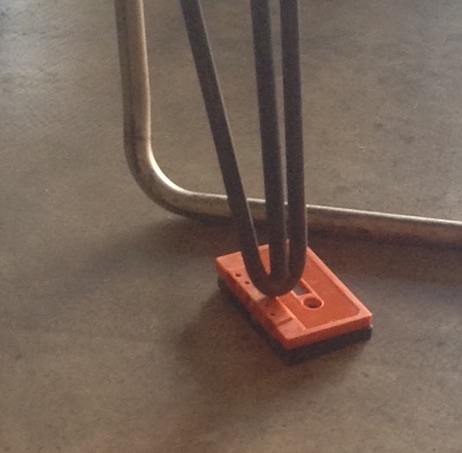 Poor tape. Ordinarily, the electron spin doesn’t have that much effect on how much current the metal can carry (its ‘resistance’). Indeed for most metals, the number of spin up electrons is roughly equal to the spin down ones. However this is not true of chromium dioxide. Although it is a metal, all of the electrons that conduct the electricity through it are of one spin type. All the electrons are either ‘spin up’ or they are all ‘spin down’. This is spin polarisation. It is something that could never happen in copper. There are many reasons that this could be interesting, both technologically and purely from the perspective of it being quite beautiful physics. What turns it from interesting to a really big question though is what happens when chromium dioxide interacts with another set of materials, superconductors. Superconductors are materials that can carry large amounts of current with zero electrical resistance. This property makes them great for things like MRI machines in hospitals where large magnetic fields require the sort of currents superconductors can carry easily. How they are able to do this gets a bit complicated but what is crucial for this subject is the fact that to conduct a supercurrent they need to have zero spin polarisation: they need to have equal numbers of spin up and spin down electrons. (If you are interested in how superconductors superconduct you can read more about them here and here). Who knew that this tape was so special? Now imagine, you have a wire of a superconductor such as very cold niobium (all spins are equal) that you connect to a wire (or a tape) of chromium dioxide (only one spin possible). You may think that if you tried to pass an electrical current down that connection there would be a problem. And you would be right: To conduct electricity, there have to be equal numbers of spin up and spin down electrons on the superconductor side but only one spin type can get through to the chromium dioxide side. There would be an electrical traffic jam. Which is all very logical and reasonable but it isn’t what happens. Instead, for reasons that we still do not understand, not only does the electrical current get through the connection, the chromium dioxide itself becomes superconducting through its proximity to the superconductor. By itself it could never superconduct but somehow, the superconductivity is leaking¹ into the chromium dioxide at the joint between the superconducting wire and the chromium dioxide tape. And it shouldn’t do this because everything we understand about superconductivity requires there to be electron pairs of spin up and spin down and everything we understand about chromium dioxide tells us that is absolutely not the case. So how does it work? Surely these two effects (of superconductivity and spin polarisation) are incompatible with each other? Is there something peculiar about chromium dioxide that makes it so susceptible to this strange effect? We do not yet know (though we have a few ideas). Many groups around the world are looking at this odd effect including a network of universities in the UK. It is taking us a lot of research and quite a few meetings involving coffee to work it out but hopefully one day we’ll get there. In the meantime, it may be worth pondering just how special those cassette tapes really were. ¹Yes, “leaking” is, perhaps surprisingly, one of the technical words for what happens in the proximity effect.